What do Susan B. Anthony, Alexander Graham Bell, Emily Dickinson, Frederick Douglass, Amelia Earhart, Helen Keller, Leonard Nimoy, Elizabeth Taylor, Sylvia Plath, Dr. Seuss, Sojourner Truth and Kurt Vonnegut all have in common? They have all impacted the historical fabric of our beloved Pioneer Valley! 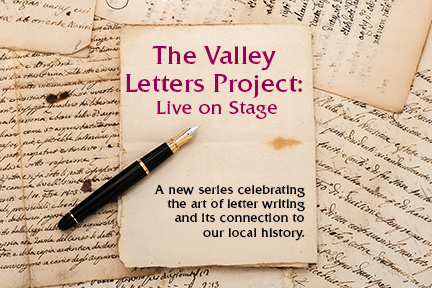 The Academy of Music Theatre is proud to present The Valley Letters Project: Live on Stage, a new series celebrating the art of letter writing and its connection to our local history. The evening will feature letters by historic people of note connected to the Western Massachusetts/Pioneer Valley region read aloud by contemporary people of note who are currently impacting the Western Massachusetts and the Pioneer Valley landscape. Join us for letters of love, home, friendship and advice with letter readings by Joan Holliday, Alika Hope, Daniel Jones, Richard Michelson, Mayor David Narkewicz, Bill Newman, Nannette Vonnegut, and MORE! Bid on our silent auction in the Salon Room, with packages from the best in the Pioneer Valley and Berkshires, including Broadside Books, The Clark Art Institute, The Dr. Seuss Museum, Eastside Grill, The Emily Dickinson Museum, Holyoke Children’s Museum, Indigo Coffee, The Lord Jeffery Inn, The Mark Twain House, MASS MoCA, The Massachusetts Review, Porches Inn, Sugar Maple Trailside Inn, Writers in Progress, and MORE! Enhance your night and come at 6:30PM for the VIP Cocktail & Hors d’oeuvres hour and browse early at the silent auction. All funds raised will support the Academy of Music Theatre.